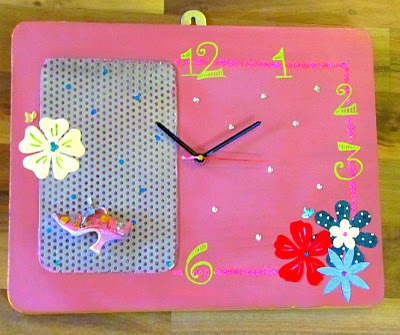 I call this clock Sparkle Pinkie. It is obviously pink as you see it and has a whole bunch of feminine features in it like the flowers, a pretty ceremic shoe and to break the girlie monotony and stainless steel plate! 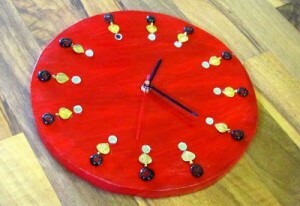 This clock is inspired by a beautiful saree I saw recently. 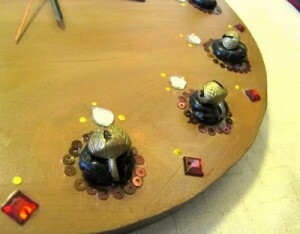 The lady carried it very elegantly on her with some tiny ghoongroos or bells attached to them. 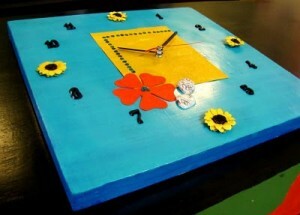 I wanted to use it in my work and the most recent one I was making were the clocks…so here it is! 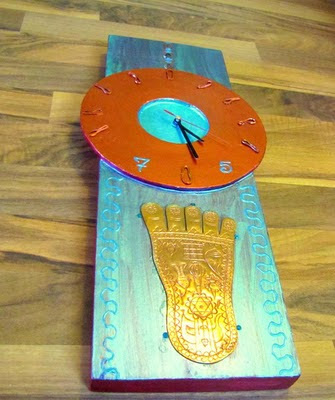 This clock is a melange of English colours and the traditional copper foot imprint with several motifs drawn in the Hindu religion. Another clock inspired by the tradition of India and seen very commonly among women, yes, it is the saree, bangle and the mirror! 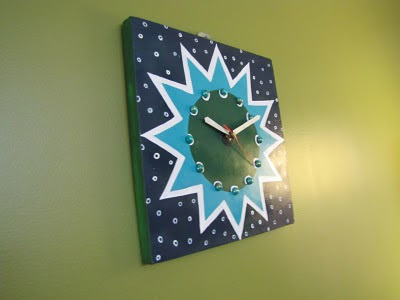 This clock is a work of geometry with some beads. It will serve best in kids rooms! One day I got up to such a beautful morning with home grown sunflowers and bold blue skies. 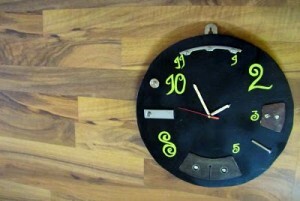 This clock is all about that day! Happy happy thoughts! Sometimes, leftovers from factories makes me want to use it in my work. 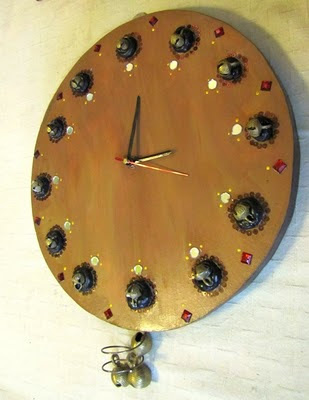 The ‘Tool Clock’ is a combination of bits of stainless steel and wood.